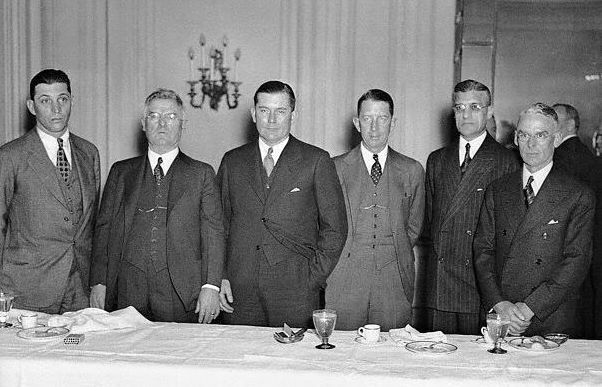 ON THIS DATE (February 25, 1933) ... Thomas A. Yawkey, New York millionaire businessman, with general investments in natural resources, and Eddie Collins, connected with the American League club as player, manager and assistant manager for the past 19 years are the new owners of the Boston Red Sox. No others have been mentioned as stockholders. The sale of the club was consummated shortly after 11 AM at the Fenway Park offices, but will not be officially announced until 3 PM tomorrow at the luncheon given by owner Bob Quinn at the Copley Plaza Hotel. President Harridge of the American League and some other guests, along with Boston newspaper men will be on hand. Bob Quinn was asked to retain an interest in the club, but could not see his way clear to do so. He said that he had had his chance and had not been able to do what he had hoped to do when he came here. He thought that it was in the best interest of those associated with him to step out and give others a chance to build a winning baseball team. Neither Quinn nor the new owners of the club with say anything asked the price paid. Eddie Collins is to be vice president and general manager and Marty McManus will be retained as the field manager. The new owners propose to start at once in strengthening the club in every way possible, and hope eventually to build a winner. They realize that this will take both time and money. Bob Quinn is to remain with them at their request, for a time as general counsel and advisor.